What do you do when you’re doing great work but only a small handful (maybe even nobody) show up to experience it? Why does growth come so easily for some, and others have to fight tooth and nail for every person? A simple framework has changed how I think about growing our company. Over the years, Faithstreet experienced times of incredible growth as well as periods of stagnation. When we’re growing, it’s all hands on deck to keep everything going and not screw it up. When we’re flat, it is a struggle to get back up to speed. The associated emotional swings of euphoria and frustration provide the background music. In more desperate moments, I’ve led meetings that have filled many whiteboards with unstructured ideas for propping up waning numbers. The "best" ideas were implemented, but only after a lot of hard work and burning a lot of ideas would we find our stride again. Hard work overcomes many shortcomings, but exhausts the laborers. Growth is more than hard work and good ideas. If the only things required for growing were working hard and being "smart", a lot more small companies would become big companies. Instead, most die. Time and again we've strayed from building a process (repeatable and scalable) to building a result (immediate and tangible). When you live in the complexities of the day to day, a unifying theory can help sort the chaos and inform decisions. The more you try to grow, the more levers you'll find that might move the needle. I fall into the "if I only had more data" trap again and again. Build up a cornucopia of numbers and facts and figures, dig through them for some kernel of understanding, and apply to the day’s dilemma. The problem is that more data reveals more choices while being agnostic about how to decide. Well, then what? I'd go back and get more numbers, of course. Growth needs a model to thrive like knowledge requires wisdom. 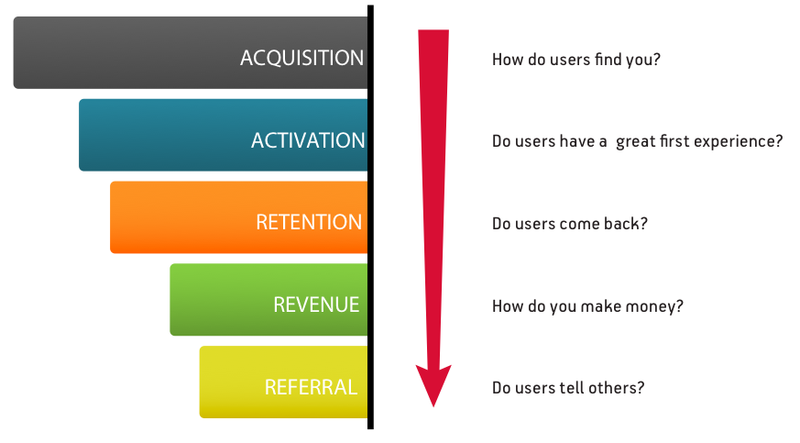 Pirate metrics (aka AARRR) is a simple framework for growth. There is an ever expanding universe of things to think about and we've suffered without good constraints. I like that AARRR is effective if you’re not growing and wondering where to focus time and resources. It is also valuable if you’re growing rapidly, but not sure why. It even works when things are fantastic and you want to get better. Over the last 6 months, it’s become an indispensable factor for our product and marketing decisions. AARRR helps clarify five stages of growth. Acquisition: How do people discover us? Activation: Do they have a good first experience? Retention: Do people come back? Referral: Do people tell others? We continue to mine this framework for new learnings. A few things we've learned along the way. AARRR only works if you build something people love. You have to build it. But if "they" don’t immediately come, or stop showing up, or don’t tell anyone else, or can’t make money, AARRR provides a model for understanding where you’re struggling and where to improve. Fill the top of the funnel first, and focus on moving people through it, one stage at a time. If you build the process right, the "score" will take care of itself.